Following a summer spent remembering the centenary of the Battle of The Somme, where our team displayed our AVRO 504 aircraft at Theipval on the day that the battle began exactly 100 years before, Sunday’s service of Remembrance was of special relevance to the Museum. With us this year were our Groupes Lourds French Veterans Association, fresh from Remembrance services in Paris and London. 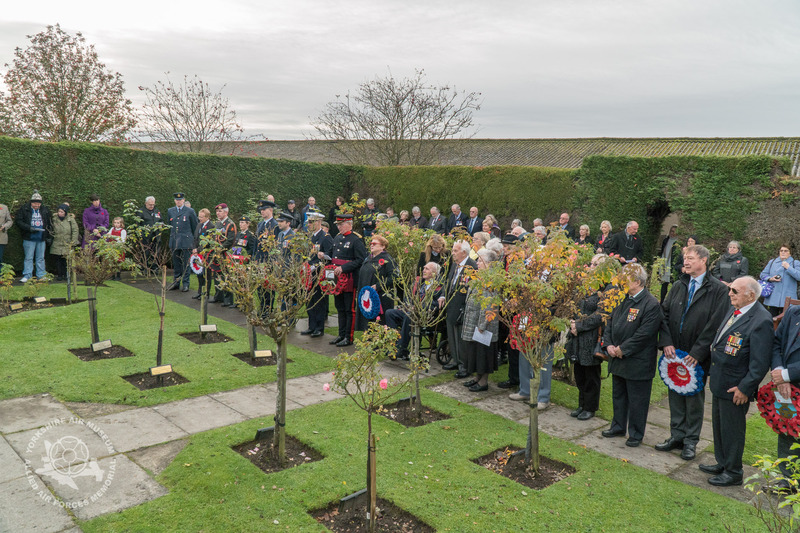 Their close partnership with the Allied Air Forces Memorial continues, and a large group from France joined the hundreds of British families and friends for the annual service on a beautiful, clear and chilly Sunday morning. This year was particularly poignant as the service at the original French Memorial began with a short verse by Paul Bogaert, President of Groupes Lourds, whose English grandfather fought at the Battle of the Somme and French grandfather fought at the Battle of Verdun during 1916. Battles in which over 2 million British and French soldiers were killed. Representatives from military forces across the world laid wreaths at the French memorial in Elvington. In addition to France, wreaths from Canada, Australia, The Netherlands and the Royal Air Force were laid alongside wreaths from Brigadier Nigel Wood, representing H.M. The Queen; The Allied Air Forces Memorial and by former French RAF Elvington wartime veterans with Les Anciens et Les Amis des Groupes Lourds. Following a traditional Yorkshire Sunday lunch at the Museum’s “NAAFI style” restaurant , a large mix of museum visitors, relatives and armed forces representatives filled the Museum Chapel to capacity. In an addition to the normal service of remembrance, six British D-Day Normandy Veterans were awarded the Légion d’Honneur (France’s highest honour) on behalf of the President of France by the French Consul, Mr. Jeremy Burton, in recognition of their wartime service during the D-Day Invasion campaign of June 1944. Museum Chaplain Rev. Squadron Leader “Taff” Morgan reminded us of the huge cost in human lives of the Somme & Verdun battles of 1916, his words bringing added meaning to this huge struggle one hundred years ago. Great Yorkshire Radio were present and recorded the service, which you can listen to below. The bright Sunday sunshine continued through the afternoon, as a short ceremony in the Memorial garden gave everyone time to reflect upon the momentous sacrifices of one hundred years ago, as well as thoses of World War Two, exemplified by the 50% French Squadron losses here from these very grounds at Elvington, and also the ongoing work by Allied Air Forces across the world today. We maintain the memory of them all. We live in an uncertain and challenging world, but it was heartening to see that the spirit of Remembrance lives on in the hearts of both young and old people alike. Recent global events show that history can be an important reminder of past human behaviour that can help us to avoid repeating mistakes in the years ahead. It may have taken many decades, but today it is evident that our modern population does indeed care about history and Remembrance is still as important as ever. Scroll down for more images from the day and the Legion d’Honneur Ceremony.